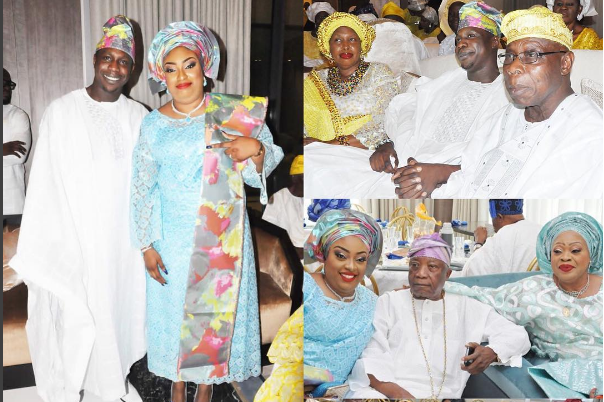 Taiwo Obasanjo is yet to give up her fight to stop the upcoming wedding of Premier Lotto Boss’ daughter Tope Adebutu and her son Olujunwo Obasanjo. She alleged that the upcoming wedding ceremony will result in feast of death. In a statement released yesterday, Taiwo Obasanjo said the upcoming wedding ceremony date was picked by satan to lure unsuspecting souls to a banquet of death that would herald in strange holocaust in the country. Obasanjo who had earlier lost an attempt to use the court to stop the wedding, stated that her plea to family members on the evil consequences of the wedding date and the need to postpone it fell on deaf ears. She also claimed that her daughter-in-law, Tope and and her mother, Rosemary Dacosta intended to use the wedding to prolong their life and renew their covenant with Satan. 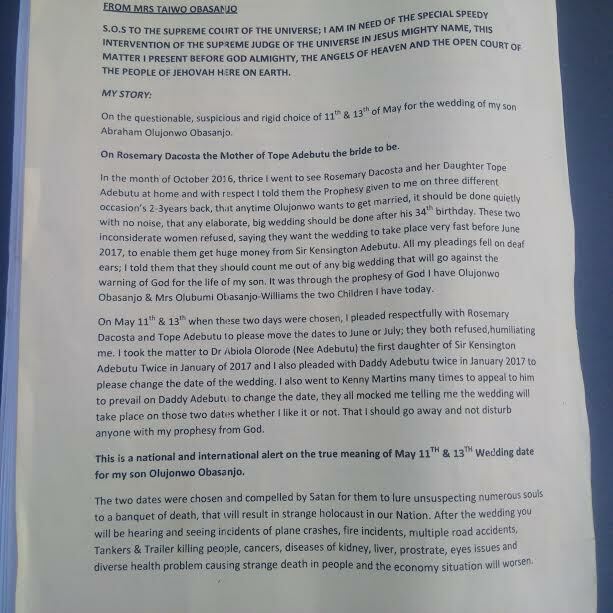 She warned those attending the wedding that immediately after the wedding, there would be strange diseases, multiple road accidents, plane crashes, fire incidents and strange death across the country. 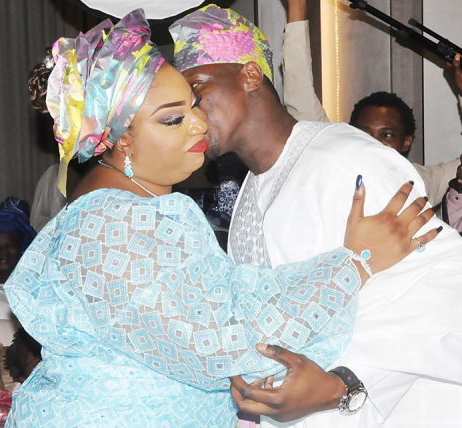 Obasanjo insisted that her son had been bewitched and cast under a spell and that all entreaty to make him see reason why the wedding should be postponed has failed. She stated that on the day of the wedding, she will led a peaceful protest march at the venue since all her effort to stop the wedding seem to have failed. ” Please I want the whole world to know that I am not mad and I am not against my son’s wedding but the whole truth will be revealed by the almighty God who sees in secret all that is hidden. I have written to the Nigerian Police and the Military Police of my intention to peacefully have a protest as a citizen of Nigeria. Me and my people shall be peacefully singing, dancing and praising God,” she said. 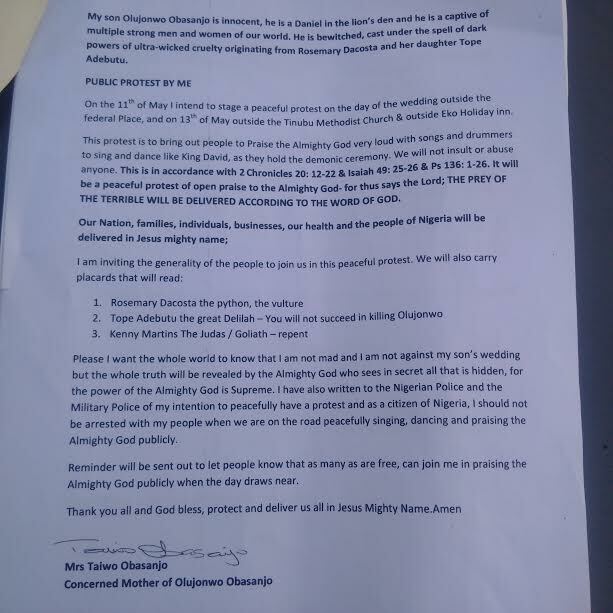 In a separate letter to the Prelate, Methodist Church of Nigeria urging the church to consider rescheduling the wedding, Taiwo Obasanjo said she would continue to pray for the liberation of her son from the spell cast on him. 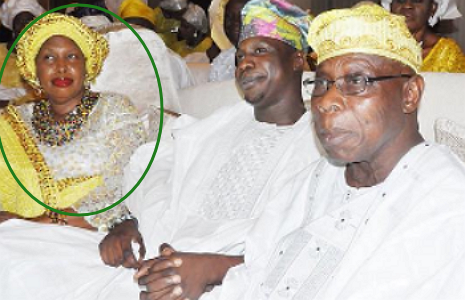 Taiwo Obasanjo Threatens To Disrupt Wedding Of Premier Lotto Boss’ Daughter & Her Son. 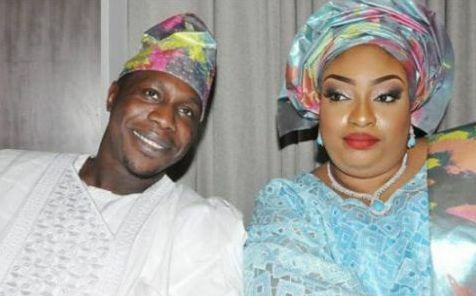 Taiwo Obasanjo is yet to give up her fight to stop the upcoming wedding of Premier Lotto Boss’ daughter Tope Adebutu and her son Olujunwo Obasanjo.